Welcome to the Twilight Hall! The German magazine Metal Hammer has been invited by the group recently for a listening session of At The Edge Of Time in the famous Twilight Hall Studios. 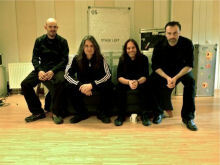 It's in the court of an old farm near Krefeld that the story begin, one after another, members of Blind Guardian greet their neighbors and disappear behind a large green gate which is none other than the studio! The group does things quietly (since the time we knew) and offers to reporters tea and cakes while André talks about his work of the previous night: "I was so excited, I went to bed at 7 am. Those melodies wouldn't leave my head." 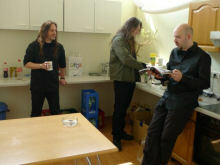 Everyone fills and more detailed information on the album starts to fall: "For the first time in the history of Blind Guardian have we worked with a real orchestra, which was recorded in Prague", sets Frederick the talk off. "I think the real musicians give the songs a big push." Hansi prefers to perceive the thing in its entirety: "It has always been important for us not to repeat any album. This principle goes back to our debut Battalions Of Fear. I don't look for parallels to earlier albums but to try to evaluate with some distance how the work settles itself in our discography. And from that point of view I'd say that we have become even more bombastic and playful. On the other hand is the new album heavier than most of our stuff." He continues with a fact long been noted by fans of the group: "You always want to self-actualize yourself on an album. But afterwards you always find something to muck about. I must have listened to the new tracks 200 times at least, but I still haven't noticed something that I would change. A good sign, and thus I'm sure: The Blind Guardian-fans will be 100% content." With heaviness and speed, is the return of ancient inspiration and fantasy is ubiquitous: "There's no basic topic, each song tells its own tale", says Hansi. "For the most part I was inspired by several books that shared the bed with me. For example "The Wheel Of Time" by Robert Jordan or the "Ice And Fire"-saga by Geroge R.R. Martin. Furthermore we dared some tougher topics. Control The Divine is based on "Paradise Lost" by John Milton and Curse My Name on "The Tenure Of Kings And Magistrates", also by John Milton." And he continues: "The recordings were very harmonic this time, partly because we had a lot of time. Because of the release of the computer game "Sacred 2", to which we contributed two songs, we finished Sacred and War Of The Thrones already in early 2008. For the rest of the year we could be creative. 2009 we recorded something now and again and were able to work on the songs. The real recordings were done between Octobre 2009 and March 2010." Sacred Worlds: The already known background for the computer game of the same name. Broader Metal isn't possible, the middle part even reminds of Nightwish. Tanelorn: The first big surprise: Return of the old role-play-feeling, the guitars race, and Hansi's singing downright aggressive partially. A dainty for the fans of earlier albums. Road Of No Release: After a piano-intro the song unfolds slowly and ends in a goosebumps-chorus. This epic semi-ballad would have stood its ground on Imaginations From The Other Side as well. Ride Into Obsession: Enough jingling, now for the sledgehammer again. Even though some experimental inclinings hide in some passages (especially in the vocals), but this Speed-bomb should score even among the by now somewhat aging discipleship. Curse My Name: Greetings from The Bard's Song. Set somewhere between Middle Ages and Middle-Earth, this mostly balladesque song gives goosebumps all over. Should be played at every king's court. Control The Divine: Mid-tempo-song with reminiscences to Imaginations From The Other Side, whereas the chorus with its surprising turns might fit better on A Twist In The Myth. War Of The Thrones: Once more the piano introduces, then comes a slow crescendo. Hansi adds a lot of emotions, but even he can't prevent that the song sounds like an English christmas carol in the end. A Voice In The Dark: The next whoopee for the older fans. Heavy guitars, aggressive parts, and Kürsch dares the very high notes once more. Nothing but the Champions' League! Wheel Of Time: For the end, another huge helping of bombast. Lots of orchestra, even more tracks, and a chorus for which Rhapsody Of Fire would relinquish Mama's pizza for the rest of their lives.